We don't often hear about the oil that comes from South America because it tends to be overshadowed by headlines from the Middle East. Countries such as Brazil, Colombia, Venezuela and Ecuador are just a few of the nations that have become central to the world's perpetually expanding petrol market. However, their clout has not come without a price. Settled within a delicate landscape teeming with life, companies such as ChevronTexaco have caused an epidemic of health concerns and environmental damage in their search for black gold. The company alone has dumped the equivalent volume of about eight Exxon Valdezes of crude oil and associated wastes into unlined open-air pits and waters in El Oriente during excavation alone, and the extraction has swelled the effects even further - almost all men, women and children in the area are almost guaranteed to develop cancer or to become sterile. Privy to the situation since he was a child, activist and Founder of Gaia Certified David Poitz has dedicated his life to educating the public on the tragic situation that has been echoing across the Amazon for decades. 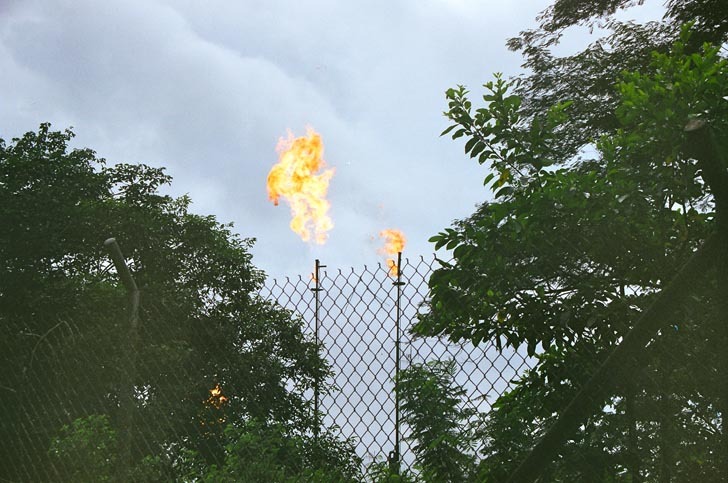 Inhabitat writer Daniel Rejto shares his experience on one of David Poitz's "Toxi-Tours" as they navigate the manmade destruction of the Ecuador's Amazon rainforest due to the oil industry. Read on for Daniel's eye-opening essay, "Powerless in a Needy Land." The Ecuadorian sun shone through the leafy greenery, casting intricate shadows upon a group of twelve college students and beating down upon their necks. David Poritz, the group’s leader, walked through the underbrush to the edge of a lake and jabbed his machete into the water’s black surface. When he pulled it out, instead of being wet, it was darkened. 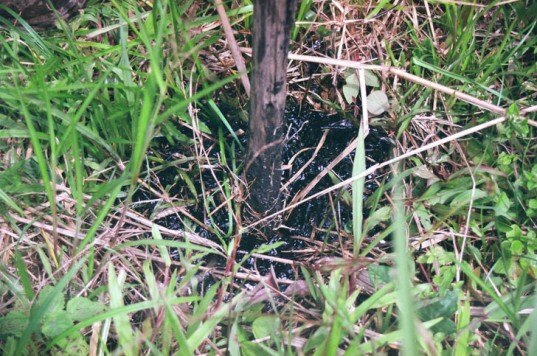 The black skin floating on top of the lake had congealed and clung to the blade, dripping oil and petroleum waste onto the soil. Only fifty feet away from the waste pit, through a small patch of forest lived the owner of the land, a one-time cacao farmer. His house sat on a plot of oil-contaminated land between the waste pit and a dusty road that ran through the Amazon. David, unshaven, but dressed in a clean white v-neck watched with the students as the man’s four children played outside barefoot. The cacao trees around them had long since grown disheveled and shriveled up. Some of the students wondered why these people didn’t leave. It was a dangerous place to live. 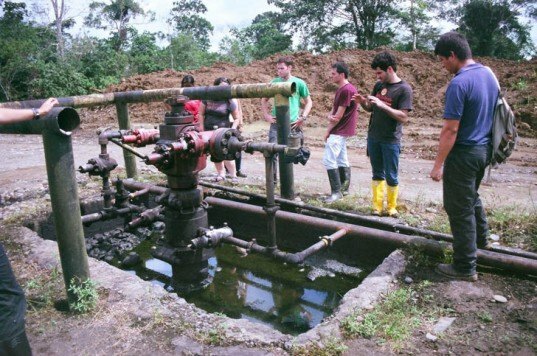 David, a college freshman, had taken the group of Brown University students to Ecuador, to this man’s land, to show them exactly this situation: the widespread and destructive oil pollution in the Amazon. He hoped that directly educating them about the country’s environmental issues would create a movement of Ecuadorian activism at Brown. 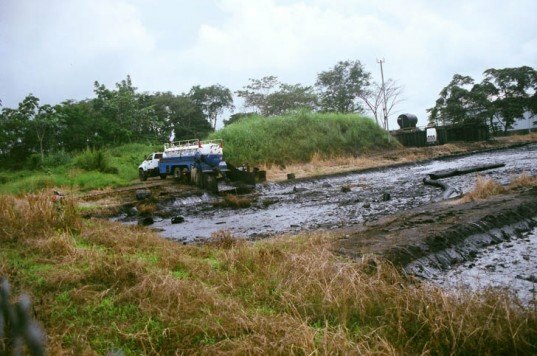 Eight years earlier, David hadn’t heard of Ecuador’s oil pollution, much less set foot in the country. For his sixth-grade final project, David was assigned a random Latin American country to study; he focused on the cultural and environmental diversity of Ecuador. Through his research he learned about a lawsuit against the oil giant ChevronTexaco, then Texaco. 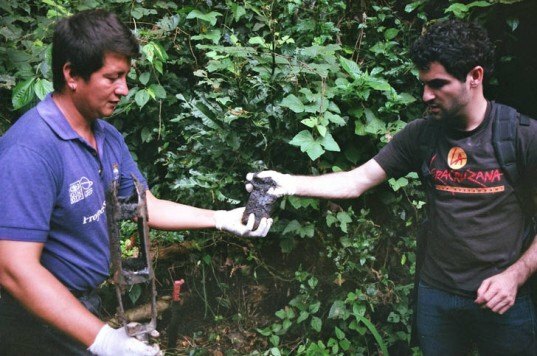 During its extraction work, the company had dumped the equivalent volume of about eight Exxon Valdezes of crude oil and associated wastes into unlined open-air pits and waters in El Oriente, the Ecuadorian Amazon, In 1993, a lawsuit on behalf of 30,000 Amazon residents was filed against Chevron, claiming they had caused $27 billion of environmental damage. The following year, in seventh grade, David wrote a letter to Chevron advocating for social justice in Ecuador. He soon learned that his English teacher was the daughter of Cristobal Bonifaz, the lawyer who had started the landmark case. David approached her, sat atop her desk and knowingly asked, “Is this your father? Because I learned about him last year through this project that I did. I’m very interested in possibly meeting him.” He had to nudge her before she would agree to introduce him, but when she did his involvement with Ecuador was forever changed. By the age of 14, he had not only begun working with Cristobal and the researchers involved in the case, but had also founded a non-profit organization called Esperanza International to educate Americans about oil issues. And so several years later there he was, only 19 years old, yet leading a group of students, many of them older than he, on a toxi-tour through the Amazon. He had arranged nearly the entire trip, a ten-day Alternative Spring Break. With help from his many Ecuadorian friends, colleagues and connections, he ensured that everything went smoothly: the flight from Quito over the snow-capped volcano peaks of the Andes and labyrinthine jungle to the oil town of Coca, the visits to off-bounds toxic sites and even the canoe ride to an Indigenous Secoya community where the students slept in thatch huts and ate freshly killed armadillo. The group visited an oil remediation site in the town of Shushufindi where the ground had been excavated to a depth of at least 25 feet. Above ground, hazard signs protruded from the Sedona-red soil and workers wore white full-body suits used for industrial waste cleanup. Despite appearances, visiting was not dangerous – only prolonged or recurring exposure causes hazardous health effects such as cancer. David led the way to the bottom of the huge pit and pointed out how here the soil was black from tar and oil waste. One day, David stopped the students on the side of the road and pointed out a creek where women were washing themselves and their laundry. One was sitting atop a floating plank, submerging her clothes into the water. Next to her, children splashed each other and swam in the river. About fifteen feet above them ten corroded pipes of various widths passed over the water, transporting crude oil through the dense foliage to coastal facilities over 300 miles away. Pipes such as these, which feed into the Trans-Ecuadorian Pipeline, have leaked over seventeen million gallons of oil throughout the country. One of the students felt an urge to yell to the women, “Stop! Get out of the water. It’s toxic!” But he restrained himself when he realized that these women have no alternative. Where else could they wash their laundry? The group then recognized that those families, like the one with the blackened lake in their backyard, couldn’t just leave their homes, their jobs and their families to move to a less dangerous area. Some of them resigned to the fact that creating a change is beyond their power. Several organized a photo slideshow upon returning to Brown. One student even joined David in his Esperanza work to educate the public and improve Ecuador’s environment. However, David felt frustrated. The Chevron lawsuit was still being argued in court. He had just met several children playing around an old Texaco waste pit. They told him that a friend of theirs had recently fallen in and died. The goal of the trip, which had been a logistic nightmare to organize, was to help prevent incidents like this from happening and to encourage students to take action. Yet only one had joined David on his mission. It didn’t feel worth the effort. Realizing that his time could be spent more efficiently, David stopped arranging full-scale toxi-tours. In the summer of 2009, only a few months after leading the student trip, he founded Gaia Certified. His mission with Gaia is to establish a certification system, such as that used for organic foods, for oil products. This should incentivize consumers to purchase gasoline and other goods with a low environmental and social impact. Most importantly it may prevent situations such as the one in Ecuador from occurring again.